If you’re reading this, it’s very possible that you’re hurting (in the best way possible) for something to cure that morning-after headache or, as I like the call it, the “leftovers from too fun of a night.” As many New Year’s Eve festivities, and other generally rowdy nights, tend to do, the next morning can be just slightly more painful than the evening before. But not to fear! While most people turn to a good ol’ Bloody Mary, my recent trip to Mexico turned me onto how they cure hangovers south of the border. 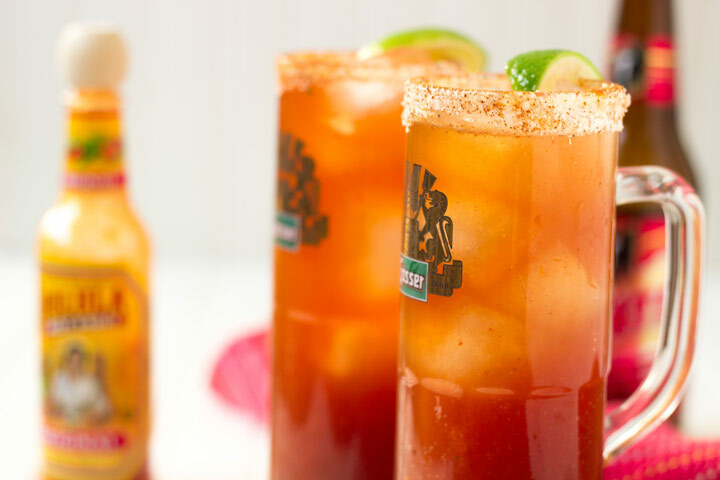 The main difference between a Michelada and an Ojo Rojo is the addition of Clamato, a beloved Mexican beverage of tomato and clam juice. Trust me, it’s not so good on it’s own, but mixed into this drink it gives you the salty / savory base that you need. Plus, the tomato juice means it has vitamins, right?? There’s not an exact recipe for an Ojo Rojo, so feel free to adjust the quantities as you like. The proportions in my recipe down below are how I like it – intensely flavorful to start, which tapers off as you sip and top off with more beer. If you can find it, Maggi seasoning (basically an all-purpose seasoning sauce that’s vaguely similar to soy sauce) gives the drink an authentic taste. I found it in a Mexican market but often times you’ll see it in Asian stores or even the international aisle of a big grocery store. If you can’t find it, don’t worry, soy sauce works just fine. 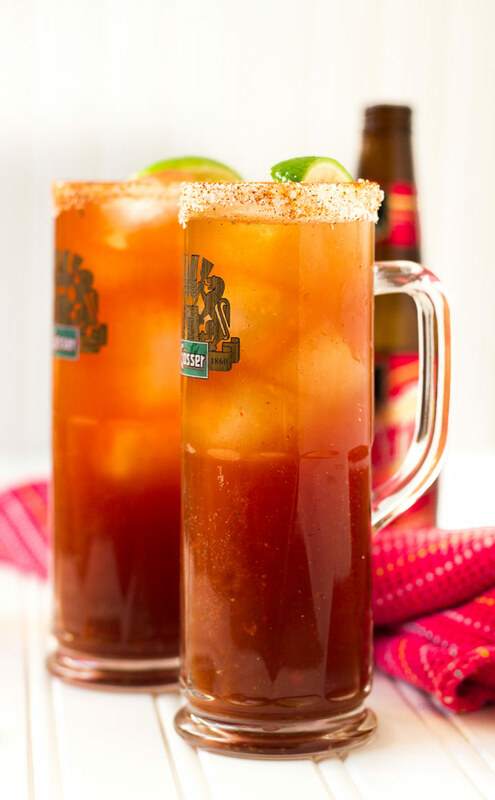 To serve an Ojo Rojo in the traditional way, fill a frosty, chile-salt rimmed mug half way with everything except the beer and serve an opened beer on the side. The drinker can top it up to start and then continue to fill as they go, or just drink the beer on the side. In Mexico, you typically order this with your beer of choice (for me, that’s Tecate) so consider having an assortment of Mexican beer and let your guests choose for a fun party idea. Here’s to a very happy (and headache-free) 2015! Salud! Combine salt and cayenne pepper in a shallow dish. 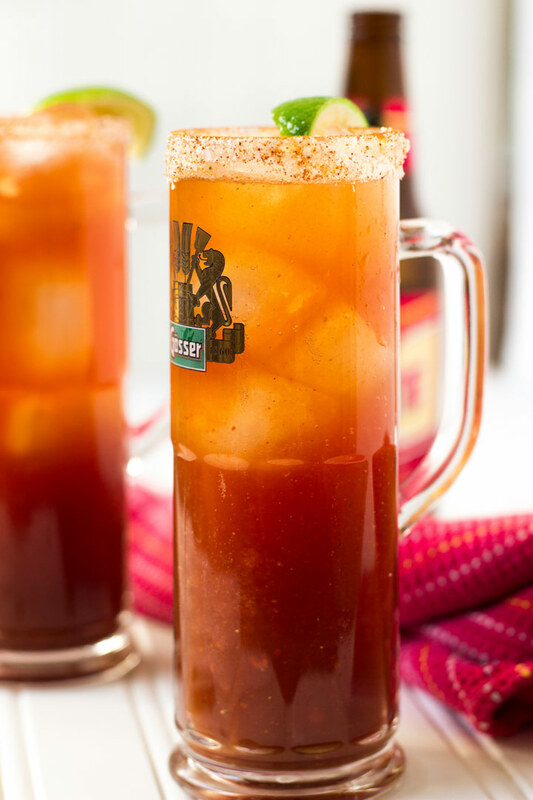 Wet the rim of a beer mug with a lime wedge and dip into the spicy salt to rim the glass. Learn how to properly do this here. To the mug, squeeze 2 wedges worth of lime juice, 4 dashes Worcestershire sauce, 4 dashes Maggi seasoning, and 2-4 dashes hot sauce (depending on how spicy you like it). Add a few grinds of black pepper. Fill halfway with ice cubes, top with cold beer, and garnish the rim with a lime wedge. Serve with the remaining bottle of beer so the drinker can top up as they go. Such a great post to start out the year with! I think my hubby would love this- pinning it for him to try! Happy 2015 Vijay! Clamato is from Canada. It is the key to making a Caesar. If you see it in Mexico it is because Canadian tourists introduced it there. I thought it was supposed to have Tomato or Clamato Juice in the recipe?